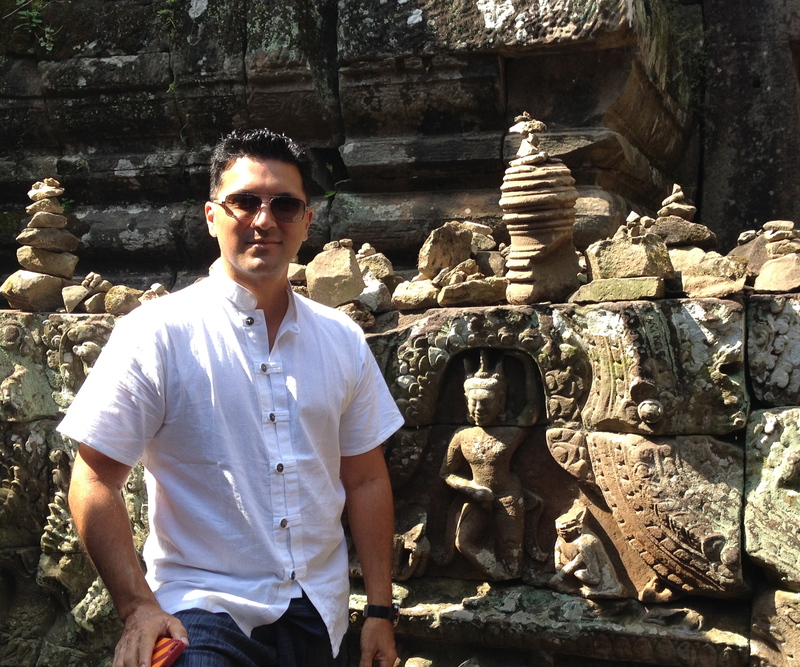 Siem Reap is the capital of the Siem Reap Province in Northwestern Cambodia. It is a popular town as the city is the gateway to the Angkor Region with its magnificent temples. These Angkor temples are the most popular tourist attraction in Cambodia and while we usually shy away from busy, touristy places, this is not one to skip. (If you like travel and have a bucket list item, I suggest adding these temples to the list! )….but more on them later. 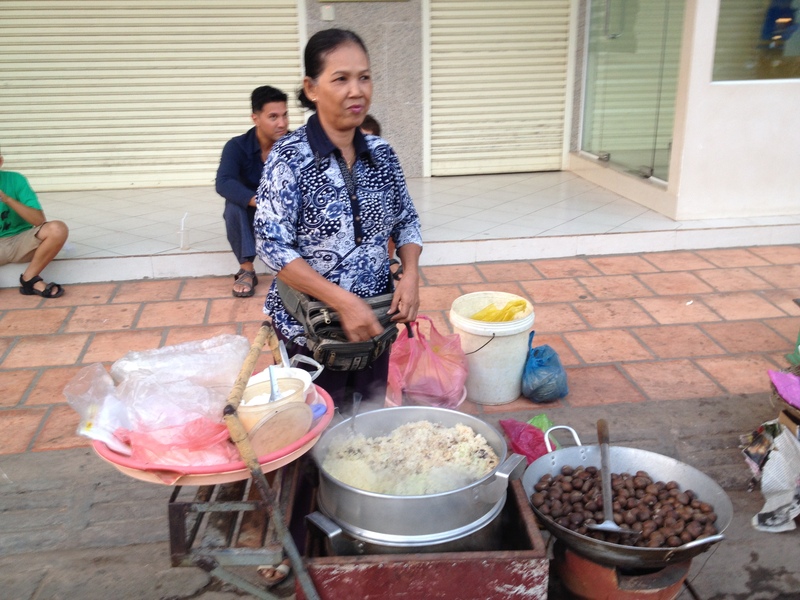 We noticed right away that Siem Reap is more set up for the tourist trade than some of the other cities in this country. The town boasts many lively café’s, even a dedicated Pub Street! and has a lively core with its Old Market and bustling night markets, restaurants and numerous street vendors. Massages here were the very best! For $3-5 (yes, you read that right), you can have an hour-long foot or shoulder & neck massage…Needless to say, we had many!! 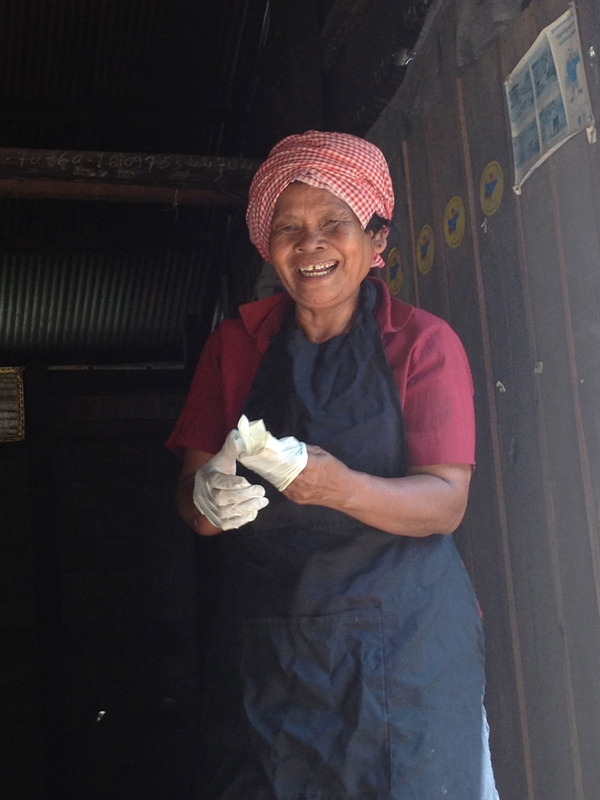 And the street vendors had the most amazing food – one lady was making these wraps that had sticky white and black rice, with bean paste and shredded coconut inside them. Two of them for $1 – my favorite dinner by far! Cambodia does not have any copyright laws (yet), so locals can copy or download any movie, tv-show, book, language program etc. you like. (Cambodians copy complete books such as the various Lonely Planet Guides and other current bestsellers and sell them on the street for a fraction of the price – however these books are mostly sold by very young, street children which makes buying them an ethical dilemma). Being on the road though, we are always on the look-out for the next book to read, or movie/show to watch. So, we did go into a fun shop in town named Rogue Cambodia (http://www.roguecambodia.com/shops/siem-reap/). It is here that they have learned to cash in on what travellers want – they offer to download any music album, movie or book to your I-pad or I-pod in a matter of minutes for a very reasonable price. We made a small investment of $20 which got us 15 of the newest movies to watch. So now we are set for entertainment for a while! After a few days of exploring Siem Reap, and actually doing a little bit of shopping (the temptation of $2 designer sunglasses, the most beautiful silk scarves for $4, and cool wrap-around pants etc. was just too tempting! 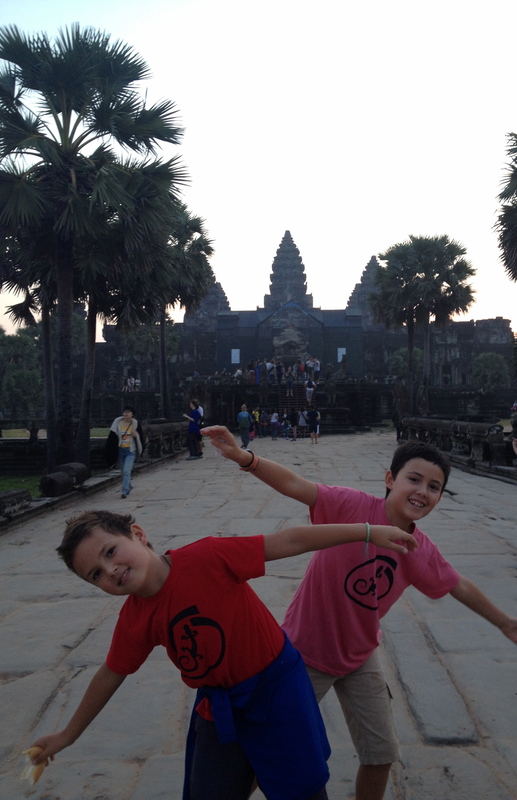 )…..it was time for our day of temples! 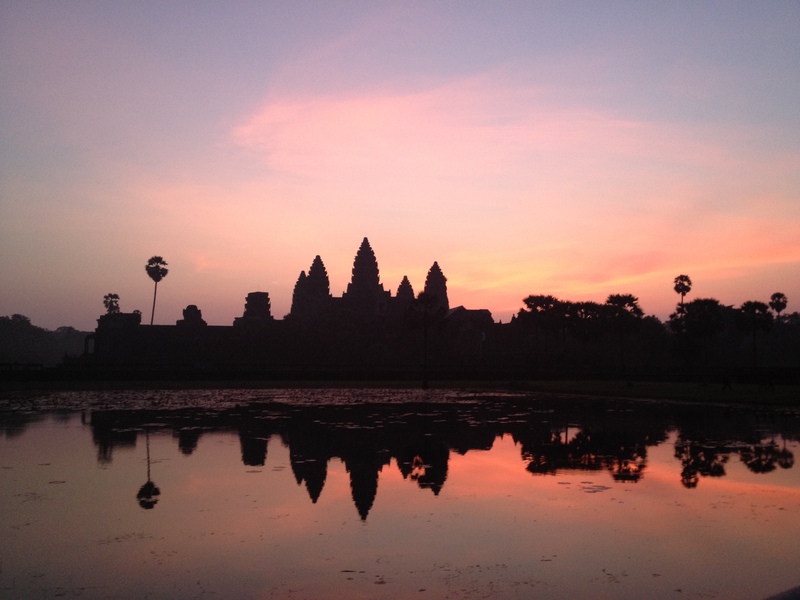 Our temple experience started with an early rise (4:30 am) to see the sunrise at Angkor Wat (this most famous temple is at the top of the high classical style of Khmer architecture, and has become a symbol of Cambodia, appearing on its national flag and currency). We were certainly not the only ones with the sunrise idea as there seemed to be a stream of drivers with sleepy tourists heading to Angkor in the early morning. However, we had a great tuktuk driver that picked us up from our lovely Tanei Guesthouse (http://www.taneiguesthouse.com) and took us to the famous temple in time for a magnificent red glow to slowly appear over its silhouette. It was quite magical! 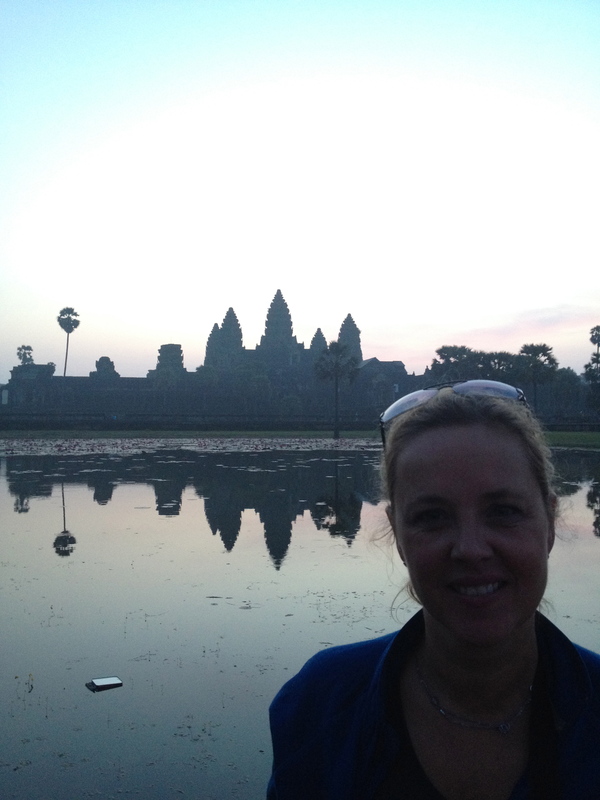 Seeing the sun come up over Angkor Wat, the largest religious monument in the world. A real Y.O.L.O experience! The temple of Angkor Wat (or “City of Temples”), was built by the Khmer King Suryavarman II in the early 12th century in the capital of the Khmer empire (present-day Angkor), as his state temple and eventual mausoleum. It is the only temple that remains a significant religious centre since its foundation. We observed this by the many monks dressed in orange that flank the various corners of the structure, praying and bringing offerings. Emile & Filou got quite excited about praying with these monks, who would offer a colourful bracelet with a meaning (“happy family”, “safety”, “long life” etc.) in return for the purchase of some incent sticks. Before we knew it, the boys were looking for monks everywhere to make an offering, pray and get their good luck bracelet as a kind return gesture! 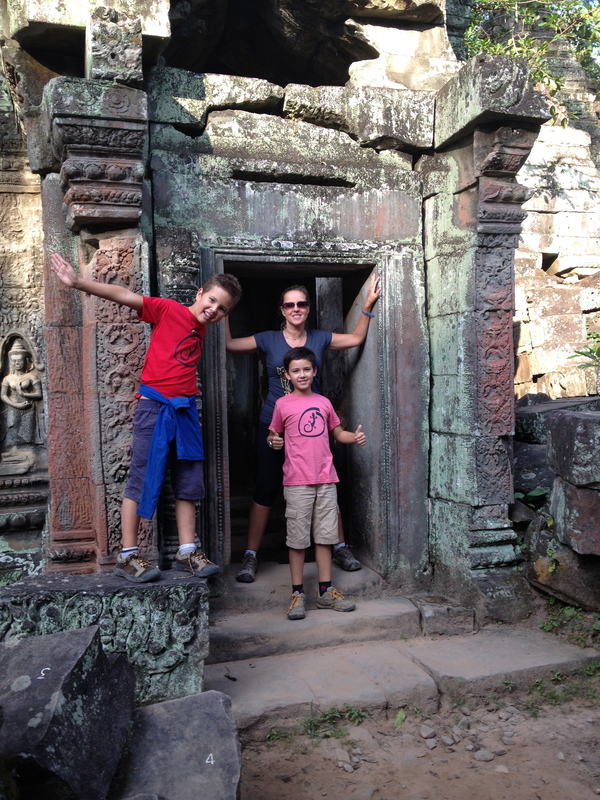 After Angkor, we opted for the “small temple circuit” – a loop of about 17 kilometers past a diverse set of temples, all completely different in look and style. The first one was Ta Phrohm – a 13th.century temple, built in the Bayon style and founded as a buddhist monastery and university. What we liked about Ta Prohm was that unlike most of the Angkorian temples, it has been left in much of the same condition in which it was found. 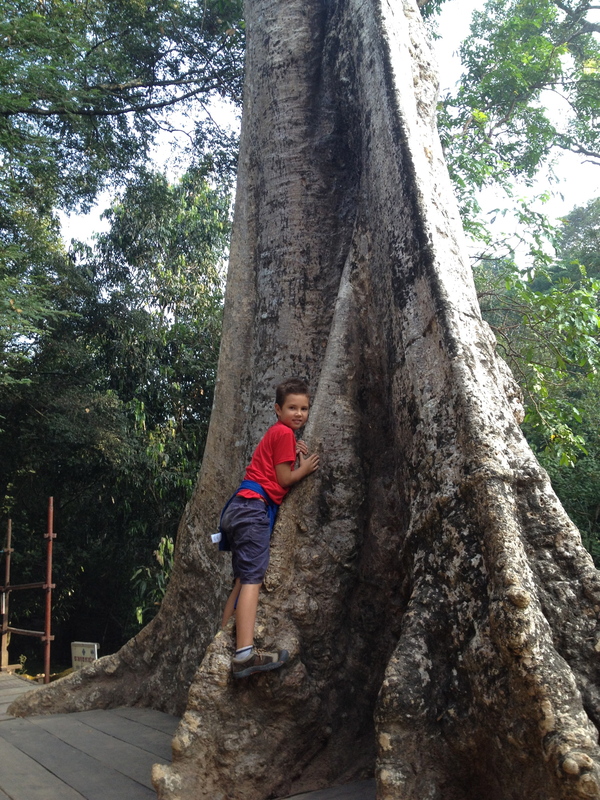 This amazing UNESCO World Heritage site has jungle-like surroundings and the boys particularly liked all the trees growing out of the ruins – some of which they were happy to climb! 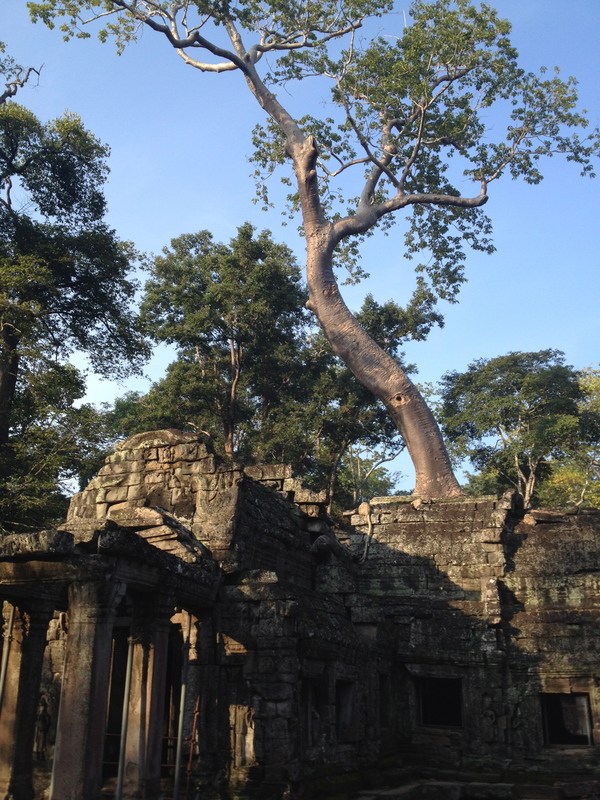 Besides the many beautiful trees that had wrapped themselves around these ruins, Ta Phrohm had an overall adventure type feel and we could see why the producers of Lara Croft’s movie, the Tomb Raider had chosen this location for filming. It was very cool! 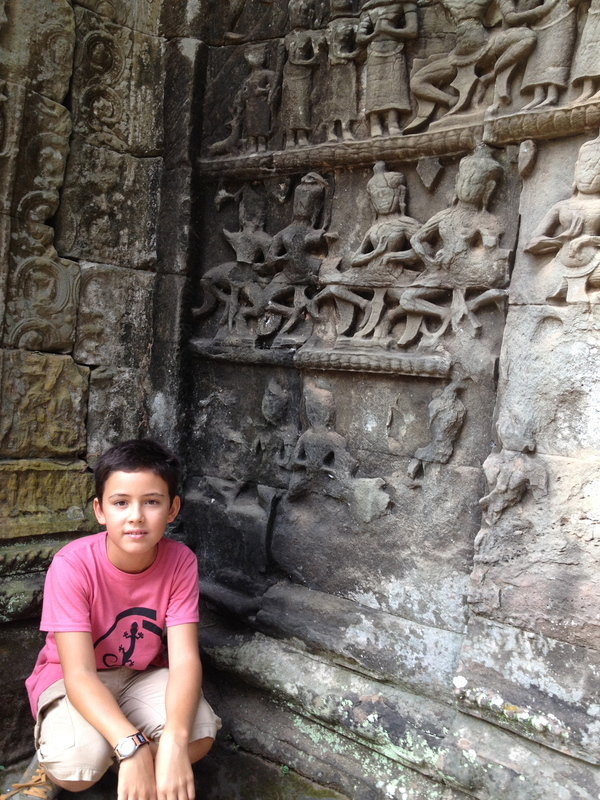 Next, it was onto the city of Angkor Thom, a temple ruin with the most impressive sculptures at its entrance. A long causeway leading to each entry tower is flanked by a row of 54 stone figures on each side (demons on the right with grimacing expressions and gods to the left, looking serene), to make a total of 108 mythical beings guarding this city. 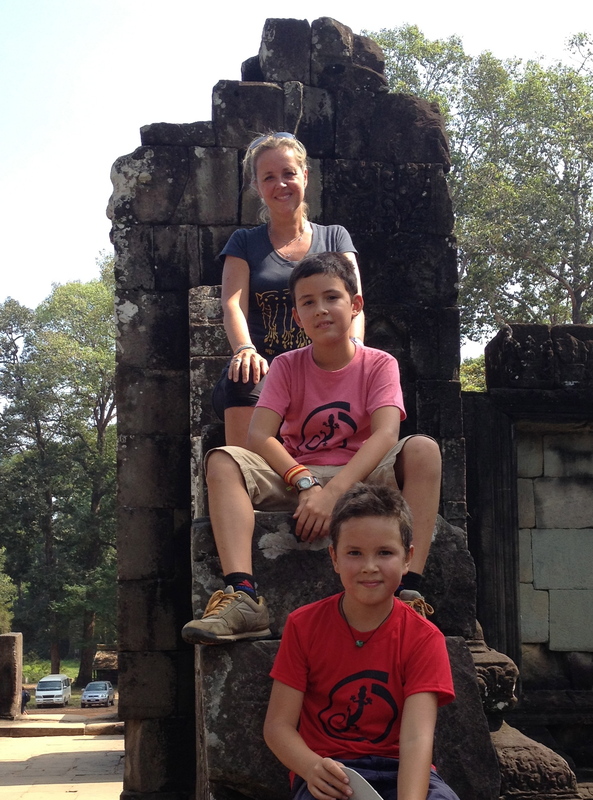 We weren’t actually allowed to visit the city of Angkor Thom itself, which looked mighty impressive with its very long, central staircase – as the kids were deemed too young (not 12 yet) to climb the very high structure of stairs. However, by this time, it was getting incredibly hot and the kids were easily distracted to move on. 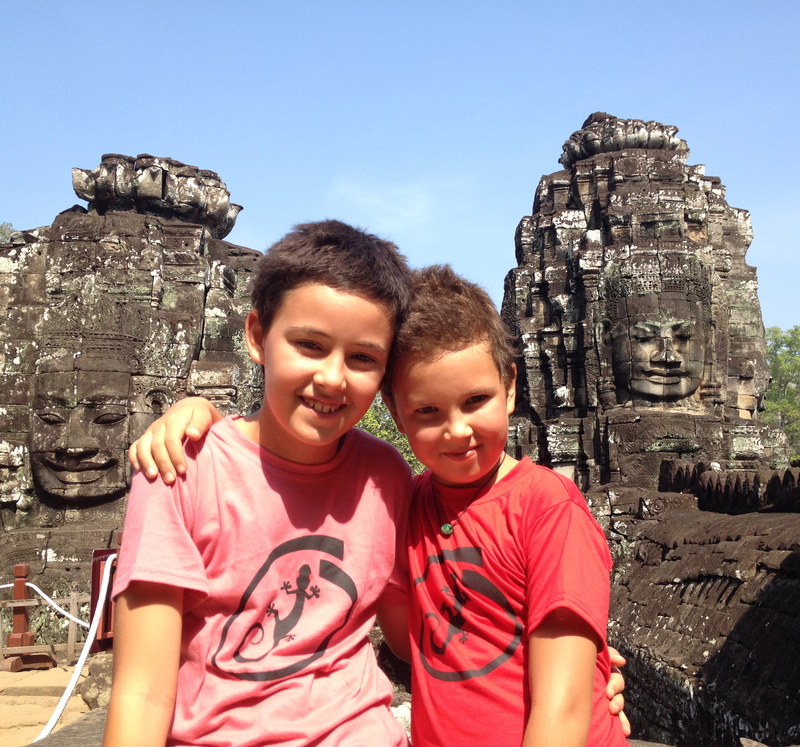 At the base of Angkor Thom, Emile & Filou found a huge, gold buddah temple where monks were praying. Hoping to make another donation in return for a bracelet, they quickly joined them. 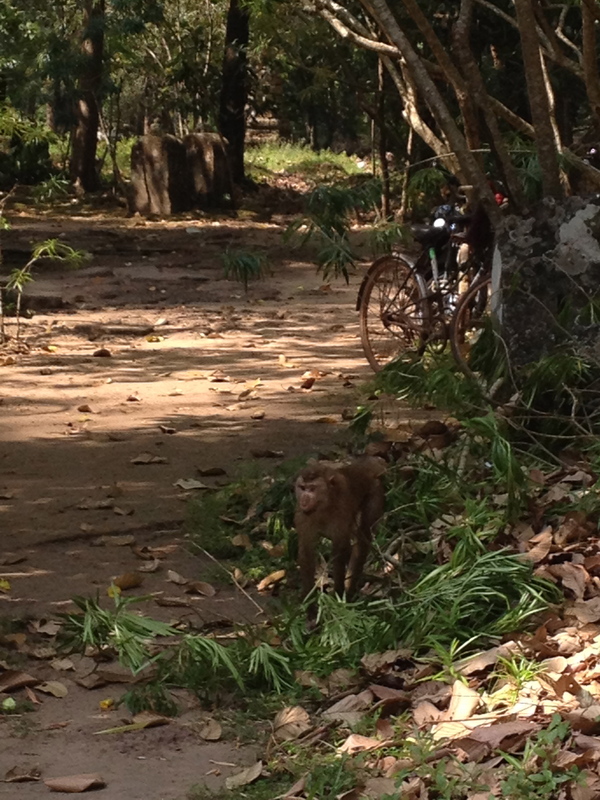 While I watched them from a small distance – a monkey “fell” out of a tree, right in front of me. Before I knew it, he saw Filou, making his way back from the temple. He must have liked his bright red t-shirt or something, as the animal made a bee-line for him and started chasing Filou at high speed. I have never seen my little man run as fast as he did! The monkey finally gave up his chase and Filou concluded that he was a speed machine (“but mom if it was you, or I was still 5 years old, the monkey would have gotten to me”). He was quite right, so thank goodness he ran fast…. as a monkey bite is not an experience we wanted to add to our list! And although many tourists like pictures with monkeys, we know better now. They are actually quite vicious, and not all that cute. Our tuktuk driver told us a story about one of his tourist clients who insisted on a picture with one of them. He took out some bananas and in no time, had a few monkeys on his shoulders. However, when he “mistakenly” grabbed a little one by the tail – its squealed so loudly that monkeys from trees all around, quickly came to its rescue and attacked the tourist. He was lucky that the tuktuk driver quickly came to his defense, but the tourist had major scratches all over his face and body, and had been close to losing an eye…. 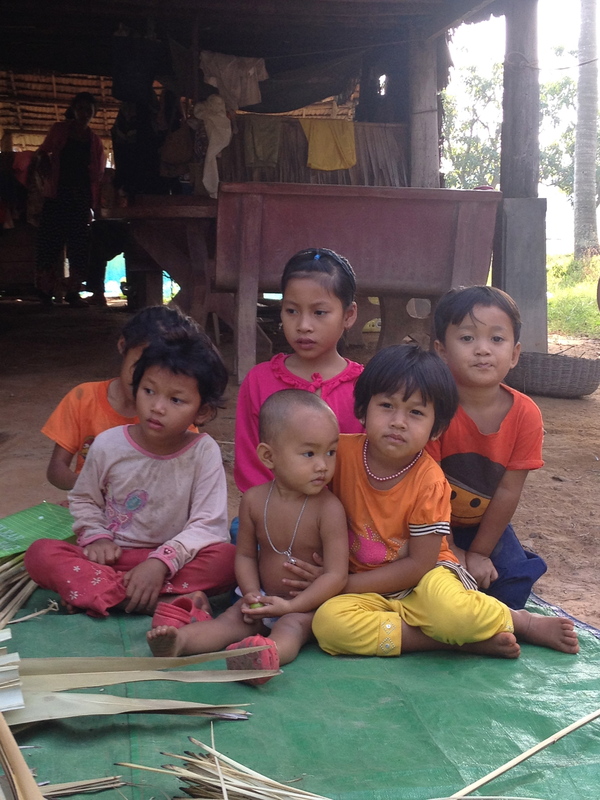 We also noticed that the local Cambodian kids are actually quite afraid of them. So NO…the monkeys – we don’t like so much anymore…but the temples. Wow, were they ever impressive, stunning, must-see!!! What a fantastic day. To close off our time in this wonderful country, we took the “Day in the Life” Tour of Husk Cambodia (www.huskcambodia.org), a non-profit organization that is working with communities to help improve the lives of Cambodian families. Their goals focus around the basics of providing access to safe water, livelihood opportunities, health, education and environment. This outing, run by Beyond Unique Escapes (http://beyonduniqueescapes.com) – was a tour that our friend Brian Robertson had recommended. 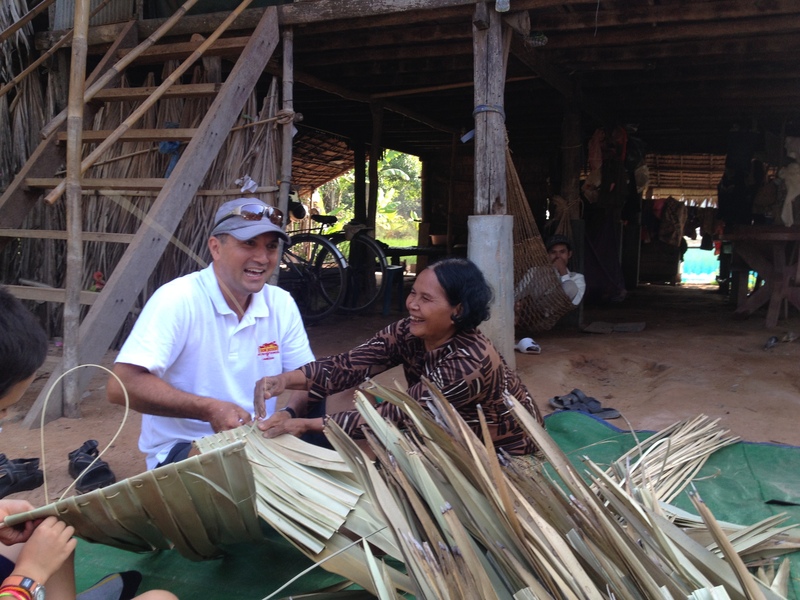 The hands-on experience promised a first-hand look at life in rural Cambodia while providing us the opportunity to learn and give back a little. 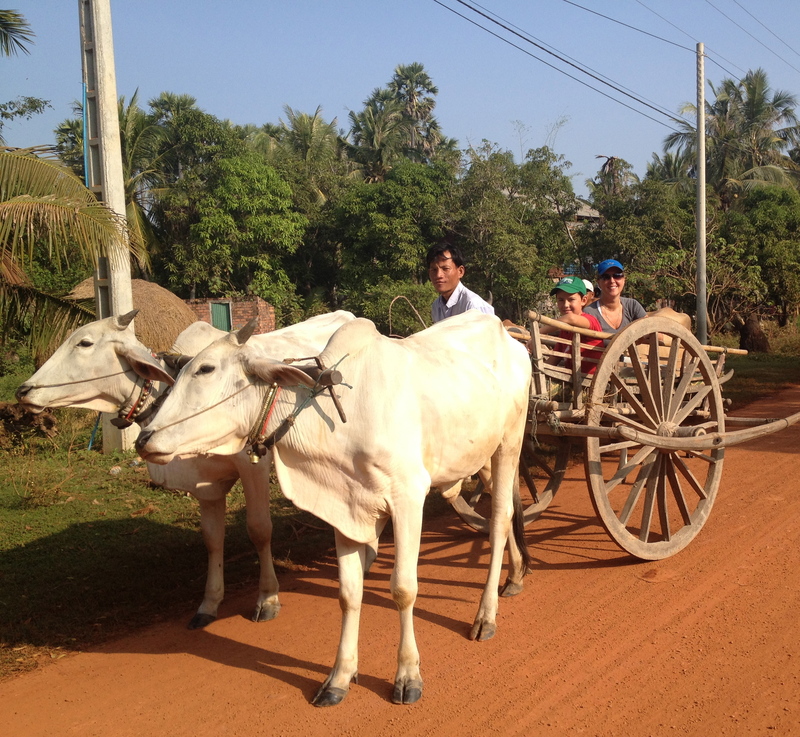 Following our arrival in the local village (about 20 minutes outside of Siem Reap), we quickly climbed onto two traditional ox carts and were driven around the village. The roads were very dusty, and at times extremely wet with thick mud – however the animals seemed to pull us through with ease. We did however, have to dodge the occasional thick tree branch and steady ourselves to remain seated on the wobbly cart (taking pictures was virtually impossible), but it made us laugh and thankful for the unique experience! We arrived at the local family, most in need of our help that morning. It was a very poor, childless couple that needed a new roof; theirs was full of holes and consequently leaking. After we said our hello’s, we sat down on a large, square mat. 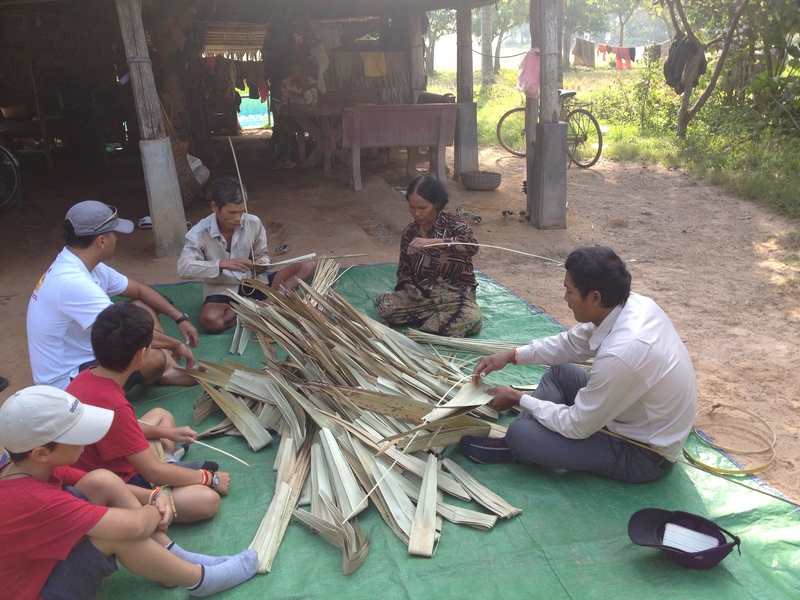 A big pile of bamboo sticks and palm leaves were put in front of us and we were taught how to weave (overlap) the leaves and string them together with the bamboo sticks to make a waterproof ensemble. Anthony, being Mr. Green Building, was just thrilled that this was the way in which were asked to help out. He really wanted to do a good job for this couple but the lady of the house, just kept laughing at him (as his work wasn’t quite what she was hoping for, I think). 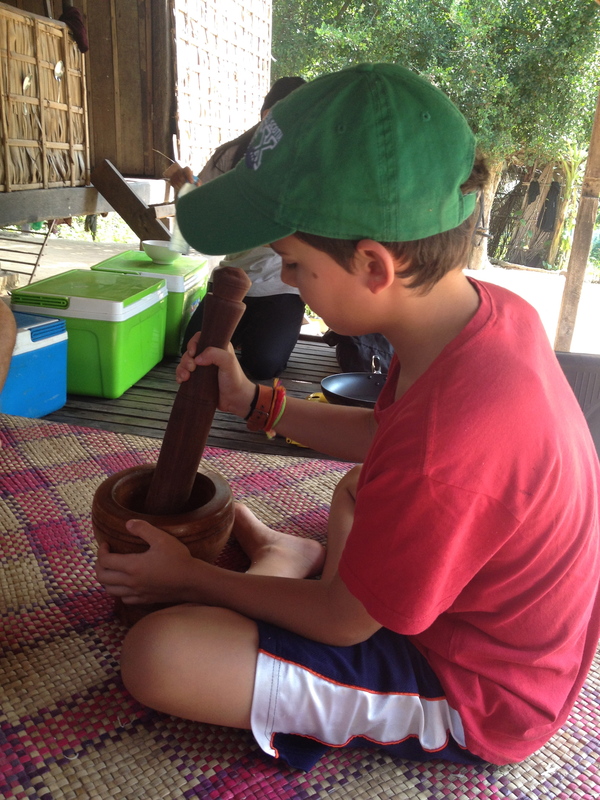 However, he quickly got the hang of it and got very productive….as were the kids! While we worked, we were in the company of many beautiful, sweet children – who came to spend a little time with us. They were just so happy to have their pictures taken (showing them their shots –gave them great laughs!) and interact a bit with Emile & Filou (swinging together in the hammocks and feeding the chickens together was a thrill). We were very pleased to have spent the morning helping this warm, smiley couple that apparently received one bag of rice as a thank-you for hosting us (the rest of our tour fee went into projects such as planting trees, implementing water purification systems and building houses and schools – things to benefit the entire community). From there, we went to another family, where together we made a chicken curry for lunch. The lady of the house (a beautiful widow), first gave us some big knives and a large mortar and pestle. With that, the kids had fun cutting and mashing up all the fresh ingredients and spices. After an hour of cutting, mashing, stirring and boiling – we ate fried fish on a sugarcane sticks and a very tasty chicken curry with lots of local vegetables. A fun, personal cooking class & wonderful experience with a great end result! Following a little rest, we took a long walk through the village and visited a local school (insulated with empty water bottles filled with dry rubbish), a beautiful temple and a successful community project – where women were learning how to make children’s toys and gift items from sowing materials together (we bought a little pencil case for the boys). A community-sewing project. Emile joined right in! 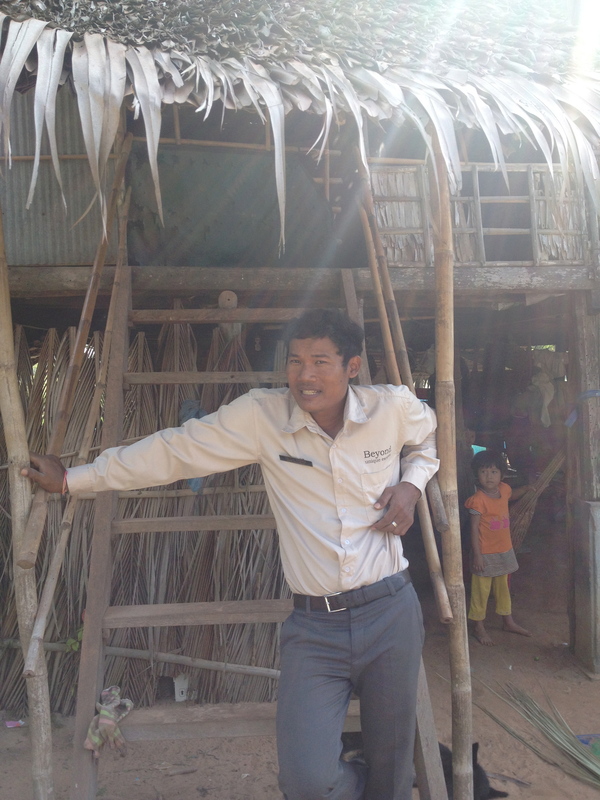 We learned a great deal about current life in Cambodia and its people, mainly because of our knowledgeable guide, Kimthet. Although the country is still extremely poor (apparently more poor than Africa – Cambodia’s GDP is made up of 60% foreign aid), its people are extremely hard working and moving towards of a better tomorrow. We felt privileged to have learned from them and experienced a little with them….….and to have travelled this incredible month in their beautiful country. 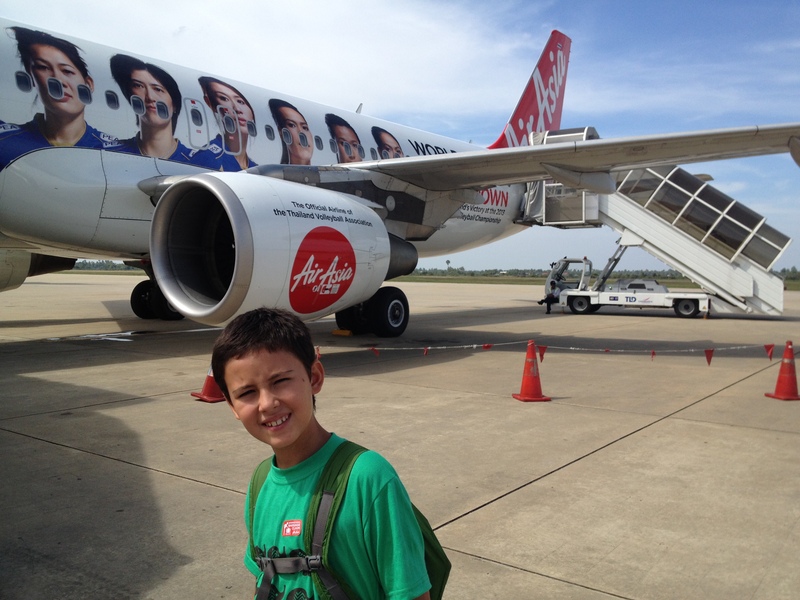 So thank you Cambodia & your smiley people, for the many wonderful memories you have given us! 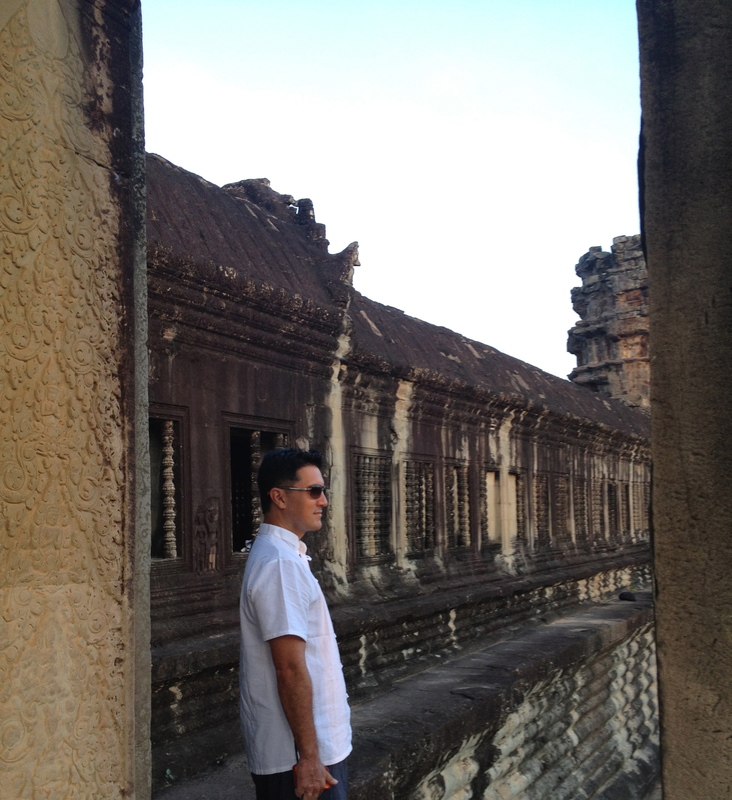 From here, it is onto beautiful Thailand….a country especially dear to our hearts!